"Imagine a jet-lagged and weary air passenger arriving in Dubai, getting off the plane, collecting luggage and then walking out to get a taxi. No passport checks, no visas issued, no security concerns. The ability of governments to communicate and share information, the ability of facial-recognition technology to accurately identify individuals, the ability of an array of biometric and other transponder-based technologies to work together  all make a traveller's arrival seamless, secure and already a reality at Dubai Airport. That's a system that was first theoretically raised at a previous gathering of the summit, and is now a reality. How about skypods that link the skyscrapers of our cities, meaning there's less traffic, less carbon footprint, less damage to our environment. These concepts are on display now at the summit, and how long too before they become as commonplace is as taking a ride in a building's lift". 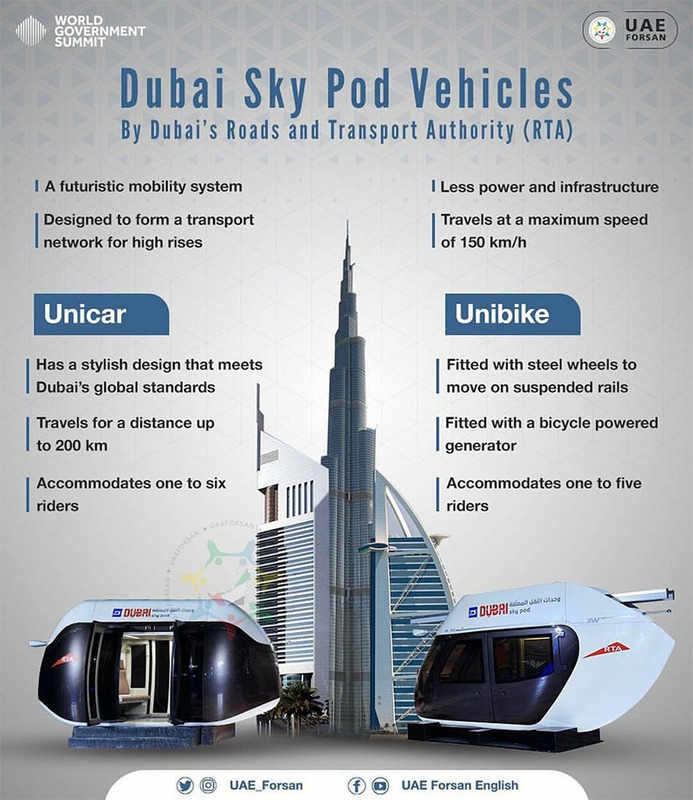 "Welcome to the Sky Pods, vehicles that will help shape the future of transportation in cities. Sky pods are designed to form a transport network for high-rises. They occupy minimal footprint (land area), have high energy efficiency, use innovative railways and operate using an automated control system". During the World Government Summit, UAE officials formulated the principles for the country's future development. This is the construction of smart cities, environmental conservation and the development of renewable energy. They also plan to strengthen the support to local talents in the IT sphere, inventions and technical education in the United Arab Emirates. Innovations is the key word for the UAE, judging by the speeches at the summit. The country even intends to introduce the position of "Director on Innovations" for each ministry during the year. To this end, the government has already signed a contract with the University of Cambridge to train sixty innovative managers there. SkyWay transport have thundered at the World Government Summit. Even Emir of Dubai, Prime Minister and Vice-President of the United Arab Emirates, Sheikh Mohammed Bin Rashid Al Maktoum, came with his son to review unibike and unicar. — Dubai Media Office (@DXBMediaOffice) 11 февраля 2019 г. — Khaleej Times (@khaleejtimes) 11 февраля 2019 г. — UAE Forsan English (@UAE_Forsan) 11 февраля 2019 г. — Gulf News (@gulf_news) 10 февраля 2019 г. 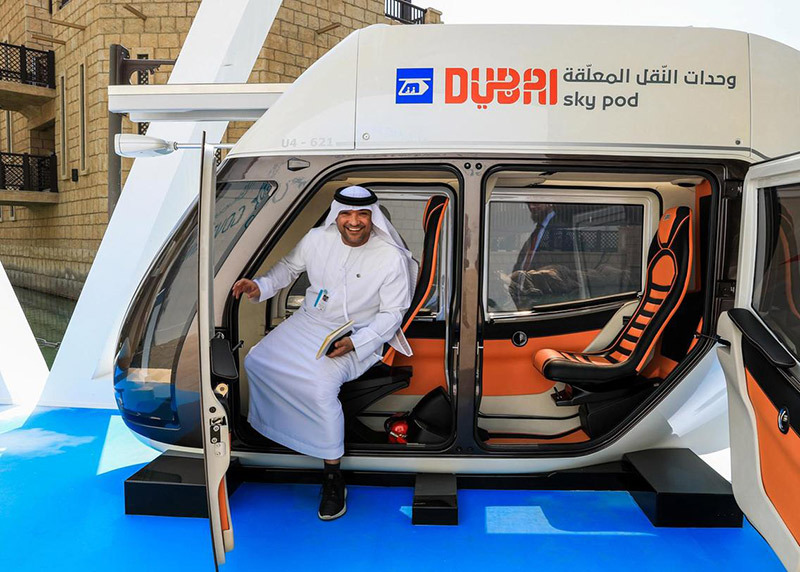 "The Sky Pods initiative is part of RTA's efforts to provide autonomous transport, one of the key aims of the Dubai Autonomous Transportation Strategy aimed at converting 25% of total transportation services in Dubai into autonomous journeys on various transit means by 2030. It is also part of RTA's efforts to enhance the integration of public transit means, and offer solutions for short journeys (first and last mile) enabling public transport users to reach their final destinations," pointed out Mattar Al Tayer, Director-General, RTA.